Will you please provide me the Netaji Subhas Open University MA Result? -- click on MA result when will publish & download that. Last edited by GaganD; June 5th, 2013 at 04:36 PM. Hi, I would like to know how can I check my results for MA for Netaji Subhas Open University? 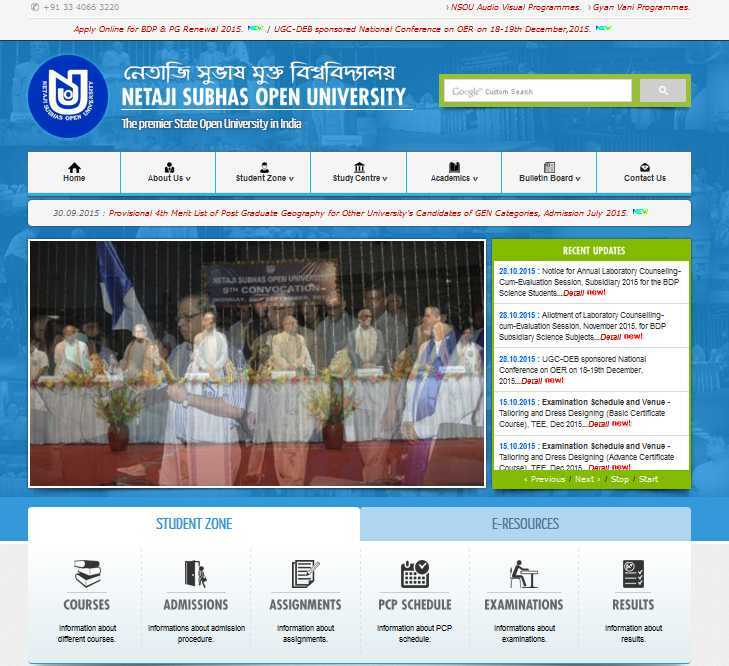 First you need to visit the official website of Netaji Subhas Open University which looks like the image attached. In the top middle of the page you can see various links like ‘Home’, ‘About Us’, ‘Students Zone’, ‘Study Centre’ etc. etc. Please select ‘Students Zone’, a dropdown menu will appear with links to ‘Courses’, ‘Admission’, ‘Examination’ etc. etc., please select ‘Examination’. Once you select Examination, two links namely ‘Examination Notices’ and ‘Results’ will show, please select ‘Results’ link. A new page will load which will have the different course name for which results have been published. Please select the appropriate course and the year for which you need the results, once the name of course appears click the adjoining download link to view the result. Through the find option please search you name or enrolment no. You will find your name & enrolment no if you have cleared the examination. Note: If incase you cannot see the course name, then probably the result for that course are yet to be announced and you may check at a later date. Last edited by Aakashd; August 13th, 2018 at 10:35 AM.